Nightforce Optics has enhanced their elevation adjustments in this year’s lineup of high-magnification Nightforce scopes. Now you can get DOUBLE the elevation travel with a SINGLE TURN of the elevation knob. For an NXS with 1/4-MOA clicks, this means you can get a full 20 MOA of elevation travel with a single turn of the knob. Bravo, Nightforce — this simple enhancement can make a BIG difference in the field. With most “high-performance” calibers, 20 MOA will get you to 700 yards or beyond. This means that the varminter can zero at all likely hunting yardages within the same revolution of the turret. That makes life much simpler, and reduces the chance of being way off in your elevation. No more confusion about which revolution you’re on…. Likewise, a tactical shooter, moving from near to far targets and back again, can likely stay on the same revolution at most target yardages. Even if you shoot out to 1000 yards, you will be able to get all the way out to 1K within two complete revolutions. This upgrade — doubling the elevation travel in each turret revolution — gives Nightforce scopes practical performance (inside 700 yards) similar to much more expensive scopes fitted with a single-turn or double-turn elevation systems (such as the U.S. Optics EREK knob). 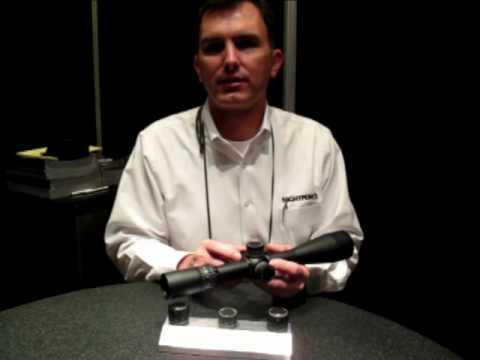 The new high-speed adjustment system will be offered in Nightforce’s 15x, 22x, 32x, and 42x series of scopes. Anticipated delivery date for scopes with the high-speed adjustment is May, 2010. What About Retro-fitting Older NF Scopes? Nightforce plans to provide an upgrade path for existing Nightforce scopes “eventually, but not right away”. The upgrade would allow installation of the “high-speed adjustment” system on older NF scopes. We don’t have any more specifics. Nightforce has NOT revealed how much the high-speed conversion would cost or when it might be available for pre-2010 scopes. Share the post "Nightforce Adds High-Speed Elevation Adjustments for 2010"
Available only on new scopes, or can the new elevation adjustment system be retro-fitted on existing NF scopes? At LAST this will be brills and I have two NF NXS both are 8-32×56 and I wont the new turrets now the amount of time I have lost zero!!!! This is great stuff NF the best scope manufactures in the scope industry I think anyway….